Kevin Roberts is urging FC Halifax Town to grasp the opportunity of reaching Wembley ahead of their semi-final with Nantwich. The Northern Premier League club have beaten Dover, Stockport County, Bradford Park Avenue and Stourbridge en route to the last four and host Town in the first-leg on Saturday. Roberts, who won the FA Trophy with Cambridge in 2014, believes the fact that Halifax are at home in the second leg is an advantage and reckons they have a great chance of reaching the final. He said: “I wouldn’t say we got lucky with the team we’ve got but I think we got lucky with the draw in the fact that we’re away in the first-leg. “Nantwich have been knocking Conference teams out and in one game without too many replays, so they’re a good team and they’re going to be up for it. “We’ve just got to go there and try to get a clean sheet, not get beaten and take them back to our ground. Roberts admits Town’s quarter-final win at Gateshead was a tense contest as they edged into the semi-finals of the competition for the first time in their history. “It was nervous and the conditions didn’t help, which made everyone even more nervous, especially defensively,” Roberts said. “There were a lot of goals, it was a typical cup game, a really exciting game, end-to-end but thankfully we were the ones who go the luck with the penalties. Roberts feels Halifax’s cup run so far has similarities to his march to the final with Cambridge, and says their first priority on Saturday should be not conceding, something they hadn’t done in the Trophy until the last round. He said: “You’ve got to grind results out in cup games and we’ve done that. “We’ve had the odd replay and that’s what you have to do. The early rounds tend to be the tough games and we’ve come through them. “We want to try and win but if we get a draw and go back to your home ground it’s not a bad result. Roberts recently completed his UEFA B coaching qualification and is open to the idea of staying in the game after his playing days are over. He said: “You go in one day a month and get to do some coaching. It’s been enjoyable and given me a chance to see the other side of the game. “There’s a lot of coaching hours, and a lot of paperwork, which people don’t understand. “A lot of planning and evaluating every session you do. “It’s nice to see what the coaches actually do, it’s a lot more than just putting the sessions on. “It’s done with the PFA and they’ll bring in college kids or we had Blackburn’s academy in one day coaching them. “There’s a variety of different ages and abilities. “I’m not 100 per cent sure whether it’s something I’ll pursue but it’s nice to have the option. “I’ve always just done football and I can’t see myself doing anything else. 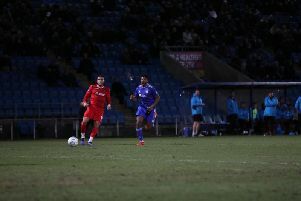 Roberts has featured primarily as one of three centre-backs for Halifax in recent weeks rather than his more regular role since arriving at the club on the right of the defence. But he has no qualms about playing in different roles, and feels hard work on the training pitch in adapting to a 3-5-2 system is paying dividends. “I feel fine playing there,” he said, “I started off as a centre-back until I was about 18 so I’ve played there quite a lot. “I’ve slotted in quite well alongside Hamza and Browny, I just let them go and win the ball and I try and sweep up. “I’ve always said I’m just happy to be playing. I do prefer playing at right-wing-back or right-back, but I’m happy if I’m on the pitch to be honest. “We’ve done a lot of shape play with the defence and the midfield in front, who are also important. Roberts says Town have players that can adapt to various roles in the team and feels playing three central defenders does have some advantages over a flat back four. He added: “I think it just gives you that spare man to clear any danger. “If teams play two up-front we normally go with a five at the back, and if they play one striker we normally change it to a back four. “We’ve been starting with a five at the back but if the opposition are causing us problems Jim and Tommy are changing it round. “There’s a few players who can play in various positions, which is nice to have.